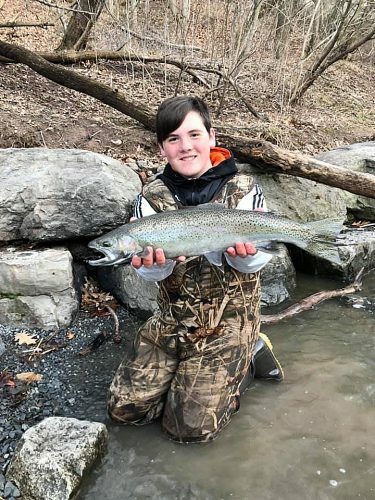 Between the 30-below one day, into the 50s a few days later and returning to seasonable temperatures, it’s been a little crazy for sportsmen to get in their winter projects. Each year I have a list of things I attempt to get done during the winter months. Understanding it’s easier to sit in front of the TV and catch up on your favorite hunting and fishing shows, I have found it’s better for my peace of mind if I work on indoor projects. When I started this a couple years ago, it dawned on me its importance when folks are serious about chasing bigger bucks. I call it my hunting year in review. It is truly a personal look at my season. Forever, I have kept a log every time I step into the woods and during this time I sit down and take apart every hunt. From looking at set-ups to wind direction to moon phases to sightings, I go over each hunt in my mind. If one is seriously into outsmarting mature bucks, you can start by figuring out how they outsmarted you last hunting season. Head for your favorite stand locations and do a postseason analysis. Look for big buck signs downwind of your stand — where a big buck might have skirted you, knowing full well you were there, while you waited in vain for him to show up. You may still be able to pick up his tracks or see where he stopped to tear up a sapling along his route. If you can pin down the route he took to avoid you last year, he might just use the same route this year. Neighbor killed the buck? No worries, another mature buck will probably move in and use the same avoidance route next year. There is nothing like a brisk walk in your hunting ground to get you fired up for the coming season. Once you have the route located, you can prepare a stand site for next year. If the area is secure, you can hang a stand or at least select the perfect tree and remove any interfering branches. The idea is to keep your primary stand location, but still have a backup stand to hunt from once you’ve hunted your primary stand a couple of times. Mature bucks are proficient at locating hunters’ setups and often skirt them by about 80 yards downwind to avoid danger. A third setup can be located downwind of the second location just in case you get into a serious game of cat and mouse. 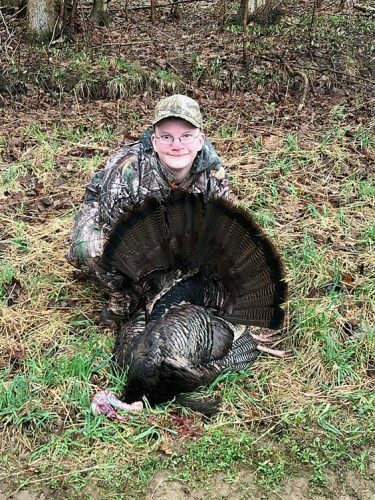 Did you happen to notice that the wind was wrong, or the deer entered the plot from the wrong side of the field every time you wanted to hunt a certain food plot or woods opening last year? Well, now is the time to remedy the situation by preparing a second or third ambush location. You may need to cut some new shooting lanes or trim a few limbs for your climber, but this is the time to get the disruption over with. 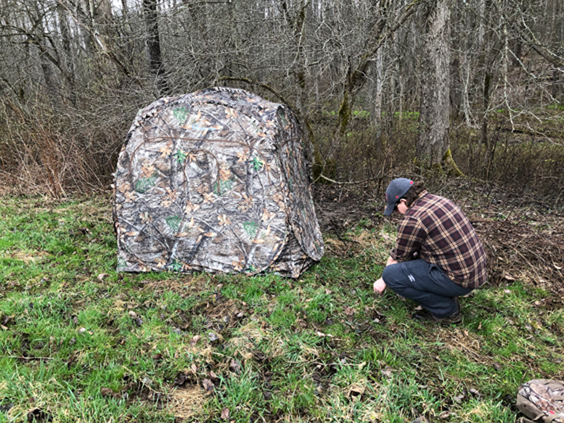 You can even set up a natural ground blind in winter which will be perfectly fine with a little added vegetation next fall. Freshly cut vegetation smells “new” for quite a few weeks after the cutting and puts mature deer on alert. October is no time to be stinking up the woods with man smell, which includes the telltale odor of freshly cut brush and trees. This is also a good time to find out where the deer spent the last part of the hunting season. Scout around until you find some month-old feeding signs and take note. This might just be the place where they will head to for one last feeding frenzy as winter begins to set in and deer season winds down. Deer typically go through distinct behavior patterns during the year and big bucks generally feed heavily to rebuild their tired bodies after breeding is completed. Find those late-season feeding areas and you just might end next season with an old boy in your sights. When allowed, cutting trees is a great way to increase food-per-acre ratio by allowing sunlight to reach the forest floor. Deer live in a world that maxes out at six feet — that’s as high as they can reach. What happens above that is of little consequence to them. What happens under six feet is all about food and cover for whitetails. A mature woodlot may produce little more than 50 pounds of whitetail food per acre. A recently cut woodlot with plenty of daylight reaching the ground can produce somewhere around 500 pounds per acre. Multiply that by, say 50 acres, and you can really start making a difference in the number of deer your property can take care of. Cutting trees also immediately makes food and cover available to whitetails. Drop a 12-inch maple, poplar, oak, ash or similar hardwood and see how long it takes the deer to find it and start feeding on the tender branch tips. They will generally browse up and down the full length of the tree, nipping off the first two or three inches of any branch they can reach. This is pretty good stuff for winter whitetails that may have been winter stressed for the past 30 to 60 days. The branch tips should now be swollen with next spring’s leaf buds that will be ready to pop sometime in April or May. Leaf buds typically contain six to eight percent protein, a welcome treat to winter stressed whitetails. Another benefit to chainsaw work is the structure that is left behind. This past year we were able to secure a prime piece of hunting ground and one of the first things we did was clear the old gas well road of over-hanging brush and trees. With the fresh cut timber, we were able direct game away from areas that we couldn’t get a stand or blind near. Over the years we have discovered that deer relate to structure just like fish do. If you want whitetails to start hanging out in a specific location, add some structure by downing some trees. Cut two or three trees so their tops all land in the same place. You’ll get all kinds of cover as well as protection for sprouting saplings. Deer love this kind of cover and will use it for years. Hunters often cut up felled trees for firewood, but they should leave the tops alone if they are trying to increase their deer sightings. Winter is a wonderful time to be in the woods provided you leave the deer alone and don’t put any pressure on them. With the hunting pressure off, you will be amazed at how quickly they get used to your presence and associate the sound of a chainsaw with a free meal. They often stand close by, waiting for a fresh tree to provide them with another week’s supply of winter food. Next week we’ll go over some ideas that will keep you closer to home.